Decked out in a Charlie Brown and The Great Pumpkin shirt, little Chase Turner was sizing himself up to a bright orange pumpkin. The one-year-old seemed intrigued by the gourd, but the corn stalk was interesting, too. 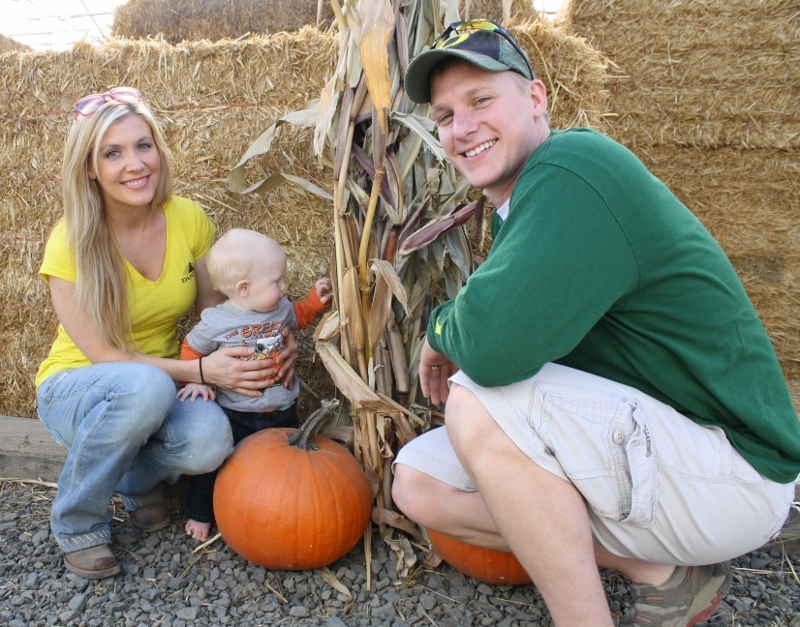 This was Chase’s first visit to a pumpkin patch, said his mom, Karissa Turner. Eric Turner from the Class of 2000 and his family made the trek down from Portland to Bauman’s Farm and Garden Harvest Festival in Gervais, Ore., just northeast of Salem, on Saturday, Oct. 6. The Turner family and other Ford Scholar Alumni and their friends and families enjoyed the fall festivities at the family farm of Cari Bauman, an FSAA Board member at large from the Class of 2002. It was a glorious autumn day for the second annual FSAA social event. FSAA President Andrea Smith said creating opportunities to gather with other Scholars is part of the “connections” theme that board members introduced in January at the general meeting. While Chase and his parents visited the pigs and goats in the Animal Zone, Theresa Logan from the Class of 2000 took her two little girls to the Sock Hop, where baby Adelie was delighted when her mom bounced her gently up and down as her sister raced through the bounce house.